The young fellow posing with the Rocket is Normand Richard, Rocket’s second oldest son (behind Maurice Jr.). Normand is my age within a few months, and I thought he was the luckiest kid in the world. 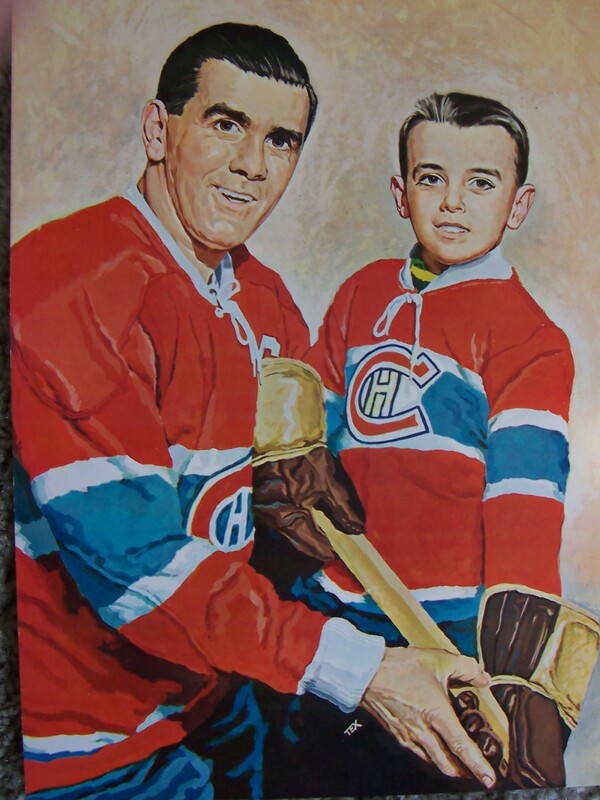 Imagine being the son of the great Maurice Richard! I used to daydream about what it would be like being the Rocket’s son. 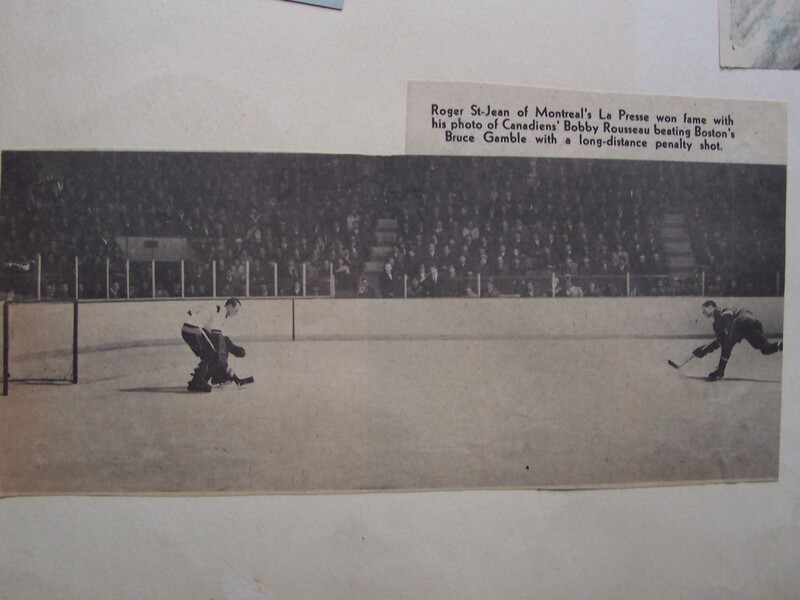 About how Normand would go to games at the old Forum and sit in special seats reserved for his family and watch his dad, the hero of so many, scoring the big goal with thousands of people cheering his name. I used to wonder what it would be like at home, having dinner and listening to stories about life in the NHL and games in the other five cities. I thought about the fishing trips Normand would go on with his dad. And I thought about my dad, a sign painter, an ordinary man with very little money, and how our tiny little house surely wouldn’t measure up to the house Normand and his dad lived in. These were daydreams an eight or nine year old boy dreamed. When the great Rocket passed away in 2000, I watched the funeral on TV, and I saw glimpses of Normand. He was fifty then, on crutches from a broken leg, and his face held indescribable grief. I’d heard many times over the years how close he had been to his dad, and it was very sad to see him saying goodbye. For a lot of reasons, I’ve felt a bond with Normand, and I really love this picture at the top of this page. The following is my column in the Powell River Peak, published March 3, 2008. 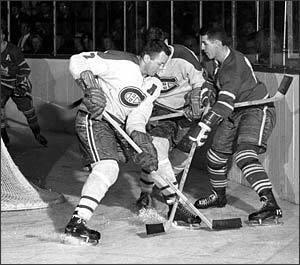 Unless you’re very young, or have never paid particular attention to hockey, you probably know who Doug Harvey is. You might know only that he was a hockey player a long time ago. But maybe you know he’s rated as the sixth greatest player of all time, and it’s between him and Bobby Orr as the game’s best defenceman ever. 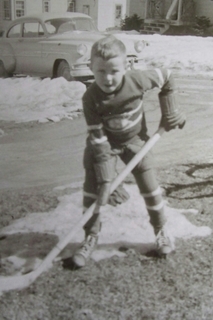 He played for the Montreal Canadiens alongside Rocket Richard, Jean Beliveau, and the rest of the cast of iconic 1950’s characters, and he was, with the Rocket, my boyhood hero. When I was a kid, my dad even corralled coach Toe Blake one night at Maple leaf Gardens in Toronto to go into the dressing room and get Harvey’s autograph for me. Doug Harvey’s gone now, but I still think about him, so a few weeks ago, I did what I had to do. I phoned his son in the Maritimes. Doug Harvey was a genuine free spirit, a practical joker, a fun-loving guy, a kind-hearted person, and a supremely gifted hockey player. He dominated on the ice in the old ‘original six’ NHL, controlling the game, slowing it down or speeding it up, making precise passes, setting the pace, and was a leader among men. He was a general on the ice, and won the Norris trophy for best defenceman a remarkable seven times. Slowly though, over the years, his health began to fail, and then, in 1989, at 65 years of age, the great Doug Harvey passed away. And I’m sure, after all I’ve read, and after talking to Doug Jr., the man with the big heart was cheering them up too.